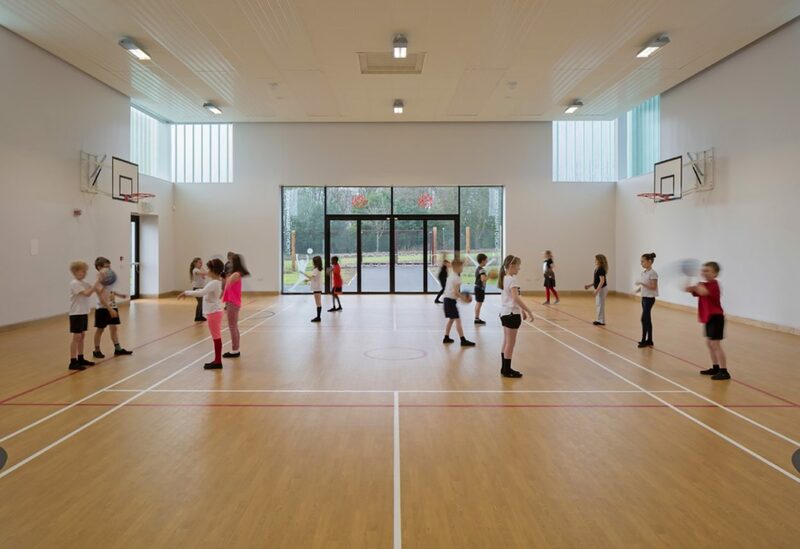 As part of West Lothian Council’s ambitious schools programme, Collective Architecture, in collaboration with consultants Scott Bennett Associates and EDP Consulting Engineers, has delivered a new purpose built extension at Toronto Primary School in Livingston. The proposed expansion and development of the school’s facilities has maintained the unique physical character and immediacy of the school’s grounds and green avenues whilst reinforcing the internal pedestrian street. 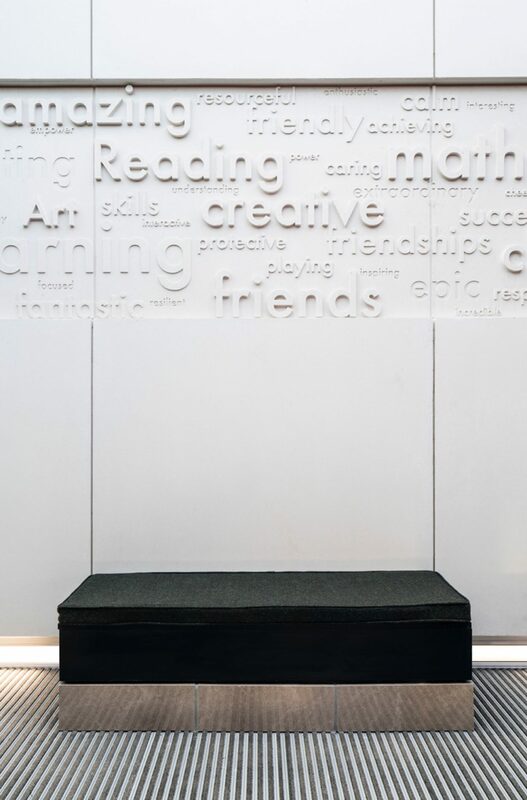 The existing classrooms are formed around central sunroom clusters, with the central spine knitting together each level and activity zone. The proposed development interlocks with this inner street and in turn provide a new DDA compliant, accessible main entrance to the school. 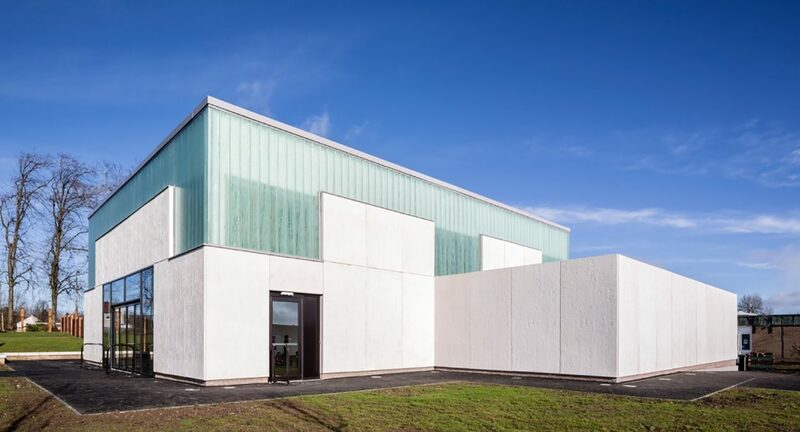 The development comprises a new monolithic textured precast concrete Games Hall that opens to the school playing fields. The textured concrete band is punctured only at high level by way of a sandblasted pattern across Reglit apertures, conveying the pattern of the surrounding tree lined avenue. 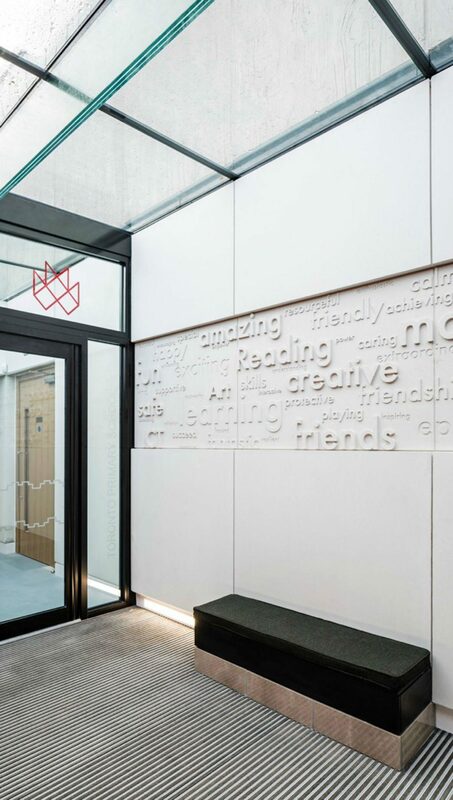 The concrete wraps the entire base of the proposed extension, except for the new Main Entrance to the school, which is over-clad in Vitreous Enamel, signifying the school’s branding colour. 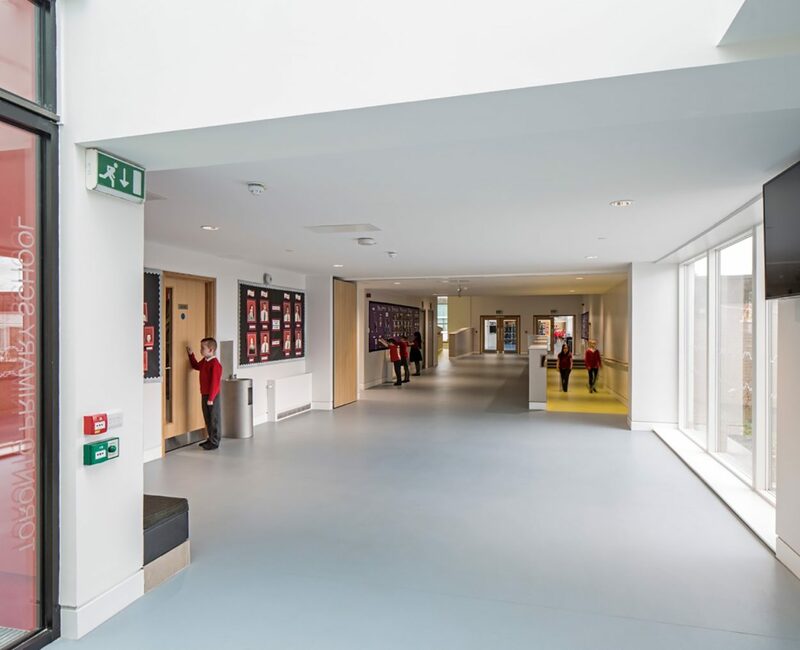 The new inner street, which extends the existing corridor, comprises of the new Main Office, Head Teacher Office and Assistant Head Teacher Office, as well as Janitors Office, Changing Facilities and accessible access to the existing Nursery. The inner street leads from the previous main entrance to the school all the way to the new concrete clad Games Hall, which continues internally. 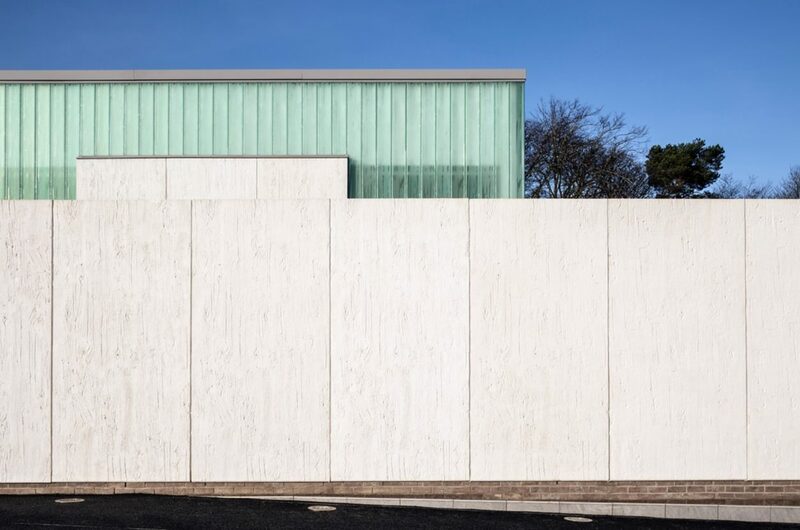 The single storey extension does not touch the double height Games Hall internally, instead this rule is broken by a large glass canopy that separates the concrete cladding to that of the single storey extensions sedum green roof. 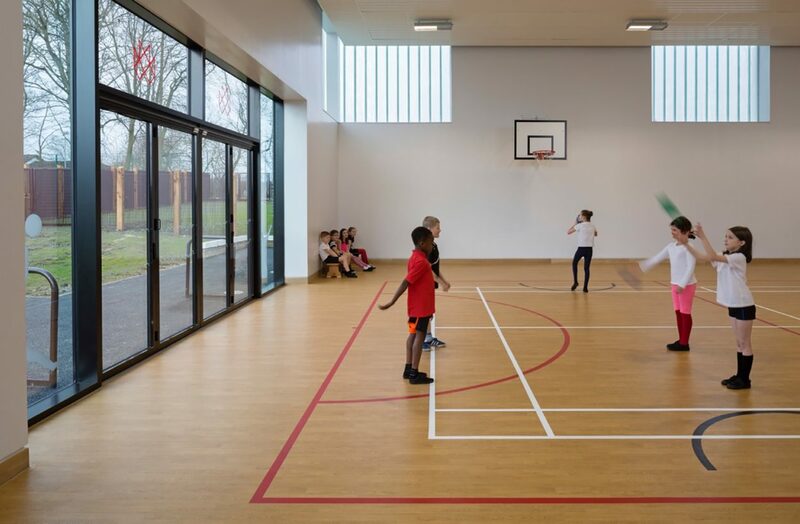 Extensive external landscaping and a re-routed vehicular and pedestrian entrance, provide a fully accessible new school entrance, which acts as the heart of the new development. The project also features an external lighting scheme to further enhance the pedestrian spaces and display the bold development in the evening, amidst the tree lined avenue.